Why use clean filtered water? Our bodies are at least 75% water so the better the water the cleaner our bodies will be. There are 10’s of thousands of chemicals, pesticides and drugs in our water supplies. This is a world wide problem. No one is required to test for them and they don’t have to tell you about them either. The EPA has found pharmaceutical drugs in every river they have tested. The EPA has also stated that it is up to the individual home owner to provide clean water for your family. Pure Water Choices vs a Franchise company? 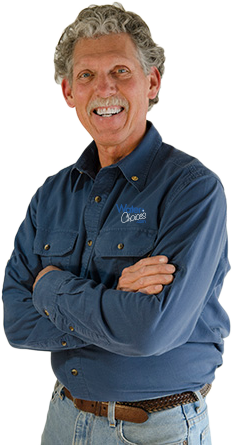 PureWaterChoices.com is not a franchise business. It is an independently owned and operated company in Colorado. That means you are not “stuck” with me. We use open market material that is sold world wide and any plumbing or water treatment company can service your equipment. When you use a franchise dealer you are stuck with them. That might explain why their service is so bad after the sale. No one else can work on the Culligan, RainSoft or Kinetico systems except them. Always call for a free second opinion. 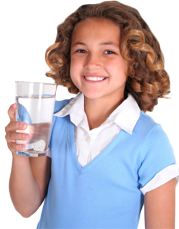 A water softener is both a luxury and an investment but not a necessity for better health. The luxury is in the way soft water feels on your skin and hair. A water softener also makes your clothes last longer and feel better. The investment side comes in how a water softener helps your plumbing system last longer and use less energy, it protects all the glass in your home. From the tile in the shower, to the shower doors, to your dishwasher, to the windows in your home, to the paint on your car. It also makes your clothes last longer because they are not being washed with little rocks. Some people don’t like the “slimy” feeling that a water softener produces. The slippery feeling is a simple reaction of the mineral free soft water reacting to the natural oils on your skin. It is not left over soap, you are clean! What is a “salt-less conditioner” system? The new salt-less systems (scale inhibitors) use a special media that changes the molecular structure of the calcium carbonate so it will only stick to itself and 90% of the calcium will wash down the drain. The remaining calcium will clean up much easier from all surfaces. It will also remove the existing calcium from water heaters, faucets and pipes. Salt-less systems are not a water softener! The scale inhibitors do not use any chemicals, no salt, no electricity, no back washing. They are good for about 10 years if a carbon tank is used before it. They cost a little more then a water softener but they are really easy. A carbon tank is recommended to extend the life of the saltless media. How much salt is in my water? Softeners do not add salt to the water. The salt is used to regenerate the media so as to continue to remove the calcium from the water. The third cycle of the back washing removes all the salt from the media tank. How much salt with a softener use? A family of four will use about 4 bags of salt. About $24 a month. The new metered back washing valves use much less salt then the old time clock valves did. What is this NanoCeram Filter everyone is talking about? This technology is also sold under the name of Ultra-D water filters. A point-of-use is usually at the kitchen sink but can be any where in the home. It is a single faucet providing clean water just at that faucet. A point-of-entry usually covers the entire home or business supplying clean water at every faucet including the hot water system. Most people chose the whole house system as the cost-per-gallon is the same. If I had to choose just one filter it would be a whole house carbon tank…I do have one! Coconut based activated catalytic carbon will remove all poisonous gases including chlorine, chloramine, trihalomethane some heavy metals like lead and will produce better tasting water in the whole house. Just remember, when you take a shower you are breathing the poison gasses into your lungs and the poison is soaking into your skin. Is one Carbon better then another? Yes! Hundreds of cities across America are now adding ammonium to your water supply to help disinfect the water. They still add chlorine to the water and so the chlorine and ammonium mixed together is called chloramines. Since the introduction of chloraminesto the water supply we now need a new carbon. I use the Calgon Centaur Catalytic activated carbon. Since the addition of chloramines we also now need larger carbon systems to effectively remove the ammonia side of the poison gasses. Ammonia take more contact time with the carbon to be effectively removed. What are the poison gasses? All city water by law has to add chlorine to disinfect the water. Thousands of cities across America are now adding ammonium (ammonia) to the water along with the chlorine. This 50/50 mixture of poison is called chloramine. When mixed together these two poisons create a very deadly gas. You don’t want to breath it much less drink it! When this chloramine reacts with some tannins (dead plant and animal matter) it then creates gasses called trihalomethanes. There are four types. Trihalomethanes are a known ​carcinogen and known to cause cancer. “They” say it’s very little poison gas and our body’s can handle it but poison is still poison and I don’t want to drink it! Why just “One” filter won’t work. Unfortunately there is not one filter that does it all or removes every thing. A water softener does only one thing and no other system will do what a softener will. Carbon does things a softener won’t do. A NanoCeram filter will remove drugs better then any other filter will. That’s why a custom build my systems to meet your desires. There is no filter that I know of that can “remove” all the contaminant from your water. The word “remove” means 100% of everything whereas the words “greatly reduce” or just “reduce” naturally means that there is still something in the water supply. If the water test shows a residual contaminant reduction level of .9999% or .9799% that is clearly not 100%. The word “remove” is used a lot in the water treatment industry to explain water filters. It is widely accepted that a removal rate of 99% or better is considered 100% removed. My goal as a water treatment professional is to educate consumers as to the the truth so you can make an informed decision and get your water as clean as possible, for good health, at an affordable price! What I think is the “best water filter” to have…I use one! Of course I am referring to the NanoCeram water filters. Nano Ceram will remove more contaminants then any other filter made. It is the only high flow, high capacity filter I know of that will remove drugs (EDC), Ribonucleic acid (RNA), Deoxyribonucleic acid (DNA), bacteria, virus’s, pesticides, heavy metals and hundreds of other harmful contaminants at a very affordable price. NanoCeram is on the space shuttle and is in the NASA Hall of Fame. Check back soon…more FAQ’s to come!